Looking for a Used iA in your area? CarGurus has 623 nationwide iA listings starting at $7,995. 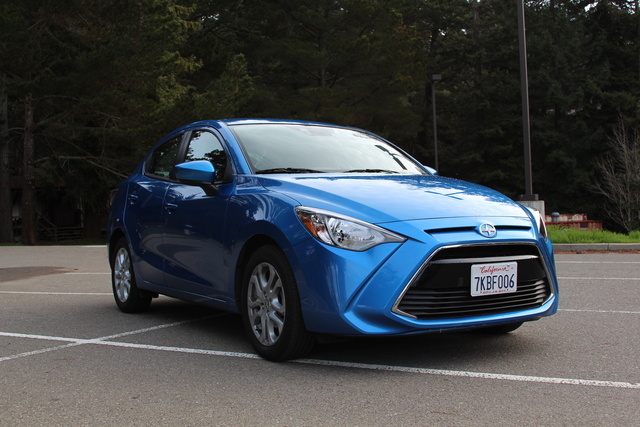 The all-new Scion iA offers an engaging ride and a wealth of features for a low price. 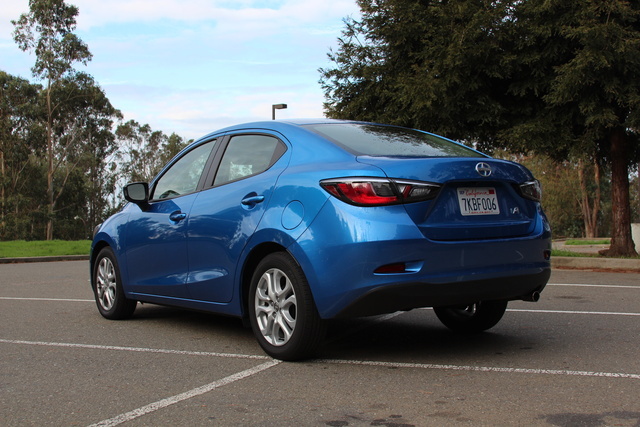 With the Yaris sedan no longer in production, Toyota found itself in need of a replacement and found Mazda had the perfect example in the not-coming-to-U.S.-shores Mazda2. So they paid Mazda to allow them to put it out with Scion badges tacked on. This is a good thing, as the Mazda2 has already impressed with engaging driving dynamics and styling that's gone a long way toward redefining the subcompact class. Rebadged as the Scion iA, things improve further with more standard features in keeping with Scion’s one-price structure. Inside and out, it’s easy to see Mazda stylings in the iA. In fact, it’s curious that Toyota was so willing to simply re-badge, as Mazda’s design language stands out quite dramatically, and this is no exception. Swooping lines along the flanks and interior layout are so frankly Mazda, I would’ve been concerned about brand confusion. Regardless, what this means is an invigorated offering for Toyota/Scion in the subcompact class. The energetic lines of Mazda have been slightly divisive, with some feeling they go too far, especially with the dramatic swoops that grace the flanks. Others find those same distinctive elements the very thing that sets Mazda apart in a landscape of offerings where few design chances are taken. That aside, the iA offers a classic sedan profile that feels only mildly squashed in subcompact form. Hit the starter button and a graphic representation of the car’s profile shows on the 7-inch touchscreen sitting atop the clean dash. Aero vents again hint at considerations above the price point, a theme carried over into the driving dynamics. There, things are truly Mazda. It’s a surprising discovery in the class, where buyers usually need to give up on the idea of actually enjoying driving. Here there are no such compromises necessary, and while not a sports car, there’s more than just city commuting to the iA. With an MSRP of $16,495 for an iA with the 6-speed manual ($770 delivery fee included), the only option to be added was the $1,100 6-speed automatic, bringing the total price to $17,595. 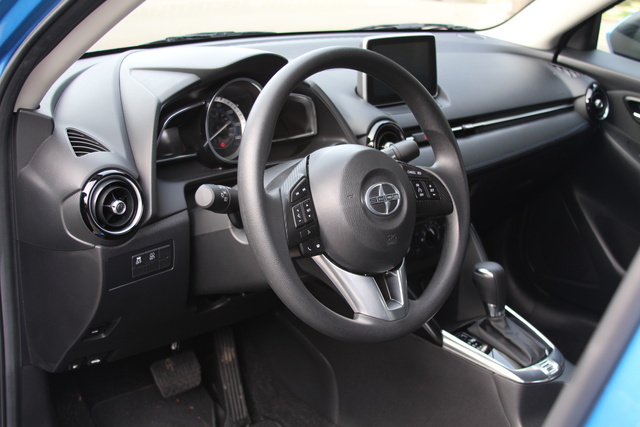 Scion prides itself on its one-price structure, so options are limited, but navigation can be added for $419. With a high-revving, 16-valve, 1.5-liter inline 4-cylinder, the iA puts up numbers that just coast past 100: 106 hp and 103 lb-ft of torque, to be precise. With a curb weight of just 2,400 pounds, this should be more than enough to motivate, but it’s the delivery that has this engine falling just a bit short. The torque doesn’t arrive until 4,000 rpm, and the horsepower waits another 2,000 to hit its peak. 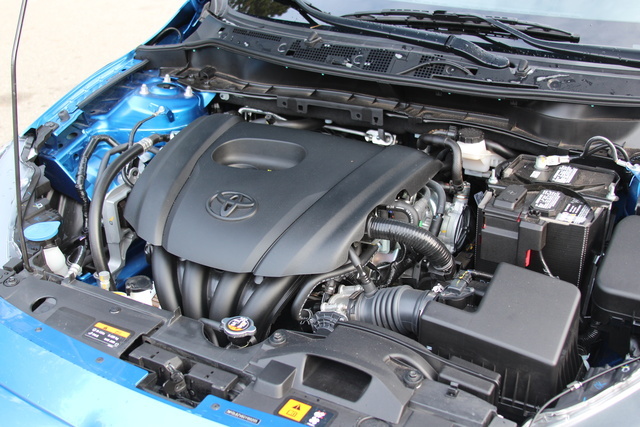 While this engine is happy to rev, this still means that stop-and-go driving — the kind you’re most likely to encounter in the city — can get rather tiring as you have to rev the hell out of the engine just to get things going. It’s bad enough on flat streets, but on the hilly roads of the Bay area, things got even worse. I certainly don’t mind revving, but when one of the major selling points of a vehicle is its fuel economy — 33 mpg city/42 highway/37 combined — having to push the engine like this every time you want to come away from a stop absolutely kills those figures. Consequently, I wasn’t able to come close to 37 mpg during my week with the iA. The manual transmission would help significantly, I think, in both the fun factor and economy, and thankfully reports have stated the manual transmission here is very easy to operate. That said, once you get the car out on back roads and can keep those revs high, the engine really shines in its power band. That’s where the math of a hair over 100 hp/lb-ft and a 2,400-pound curb weight finally makes sense. More than that, the iA has the handling to keep things interesting as you shoot through curves with the engine running at more than 4 grand. Yes, the iA is built with a MacPherson strut front and torsion-beam rear suspension, and that’s a setup that would be found lacking in a 3,500- or 4,000-pound car. But in a car with 1,000 fewer pounds coupled with a solid, balanced chassis and well-weighted steering, there’s more fun to be had here than you’d expect. The fact that the iA has a hard time delivering its advertised 37-mpg combined rating has to count against it here, but it’s still a competent economy performer, especially on flatter terrain and with less time spent spooling through canyons. More than that, it’s a comfortable car that shows a level of refinement you wouldn’t expect at the price. While I feel the 7-inch touchscreen sits rather obtrusively on the otherwise classic and handsome dash layout, it functions well with a simple i-Drive-style controller and some interesting design features in the interface. Unique touches like the radial selection screen for radio stations are something you don’t generally see in infotainment interfaces, and it’s a welcome, fresh approach to what can be a very boring aspect of car ownership. 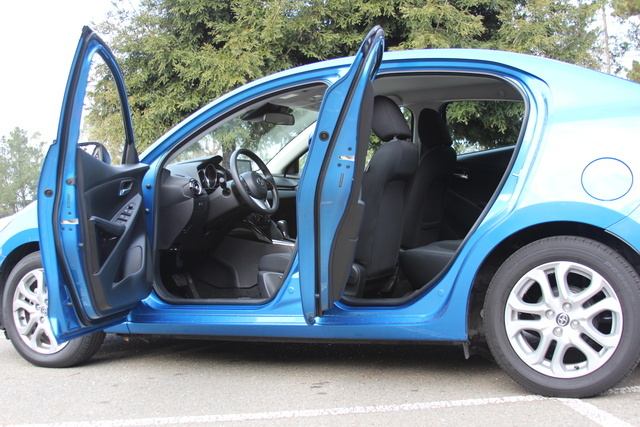 While the back seat doesn’t garner any praise for overwhelming space, it’s wholly adequate for a subcompact sedan. It seems that most of the iA's space has gone to the trunk, and at 13.5 cubic feet, it’s a much more usable allocation, especially for the class where that number makes the iA a standout. Couple that with elements like a standard tilt-and-telescoping steering wheel, 16-inch alloys, and push-button start, and you’re getting a lot more than what you’d expect from an economy subcompact — and that’s before we get to technology! Believe it or not, the iA shines here as well. 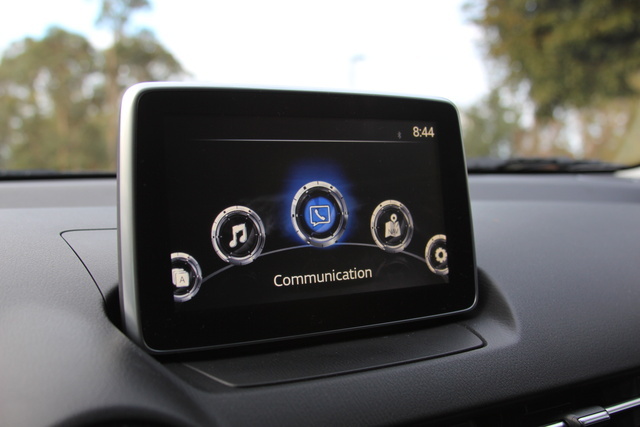 While you’ll have to pay $419 to add navigation, the iA comes otherwise very well equipped. The 7-inch touchscreen and dial controller work better than most, and two USBs mean you won’t fight with passengers for phone-charging rights. Plus it comes with all the usuals like streaming radio, USB, Bluetooth, and voice recognition. A backup camera is a welcome addition two years before federal regulations require it, even if it’s not wholly necessary in a car with visibility as open as the iA’s. But the real noteworthy addition here is a low-speed forward-collision warning system that utilizes automatic braking between 2 and 18 mph to avoid accidents. This is a feature that’s usually relegated to the option lists of luxury vehicles, and here it’s standard. Well done, Mazda/Scion. The iA comes with front disc and rear drum brakes, which are more than adequate for a car of this weight, however with economy tires its 60-0 braking distance is a rather disappointing 125 feet. With stickier tires, this would be much improved, although you’d sacrifice some mileage. With the low-speed forward-collision warning system, some additional props are deserved here, and the standards of traction and stability control are of course included. Front, side, and curtain airbags are included for both driver and passenger as well. Unfortunately, the iA has not been tested by either the National Highway Traffic Safety Administration (NHTSA) or the Insurance Institute for Highway Safety (IIHS). But the car upon which the iA is based — the 2014 Mazda2 — is offered for sale in other markets and has been tested. The IIHS awarded it the top rating of Good for frontal-offset and roof-strength tests, but side and rear crash tests earned only an Acceptable rating. Even worse, small-overlap frontal crash tests saw a Marginal score, which is one better than Poor. The Euro New Car Assessment Program (ENCAP) gave it an overall rating of 4 out of 5 stars, while the Australasian New Car Assessment Program (ANCAP) gave it 5 out of 5. A $17,000 MSRP puts the iA in a very competitive place. While options like the Honda Fit offer more space and the Ford Fiesta offers an even better driving experience, the iA pushes right down the middle for a strong selection in both categories. However, the news this February that Toyota will discontinue the Scion brand is sure to affect resale value down the line. 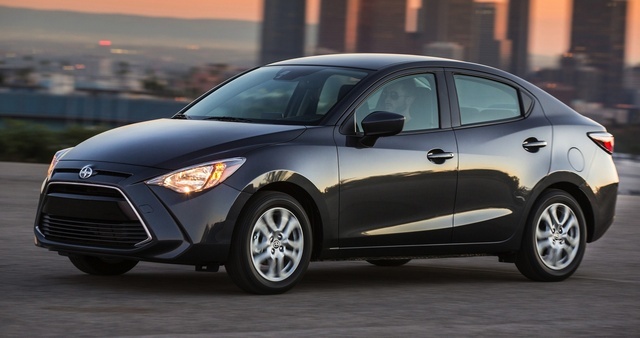 What's your take on the 2016 Scion iA? Users ranked 2016 Scion iA against other cars which they drove/owned. Each ranking was based on 9 categories. Here is the summary of top rankings. 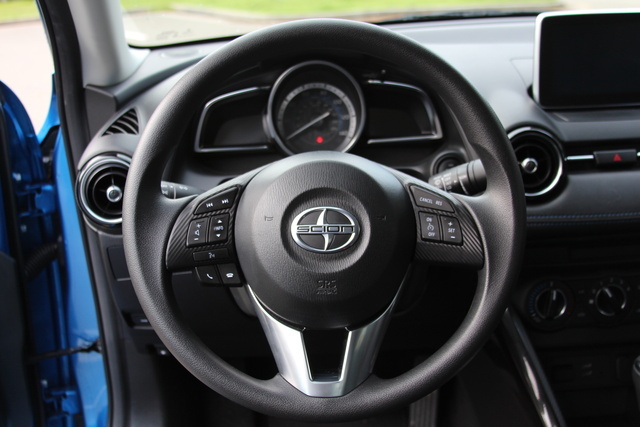 Have you driven a 2016 Scion iA? What Does Wrench Symbol Indicate?